MY CALL: MMA fighters are tough, but those who face life’s most trying dealt hands are tougher. Between the exquisitely written characters, engaging fights and solid guy-cry, I can’t remember feeling so affected…and it felt amazing. I don’t give out many A’s without caveats, but this gets an A+! IF YOU LIKE THIS, WATCH: While considerably less intense, Mark Wahlberg and Christian Bale brought The Fighter to gritty life. As did The Wrestler. Then get back to the root of it all with Rocky, Rocky IV and Rocky Balboa! CAST: Joel Edgerton (Animal Kingdom, The Thing 2011), Tom Hardy (Inception, Bane of The Dark Knight Rises, Charles Bronson of Bronson), Nick Nolte (Tropic Thunder, Hulk, Cape Fear). SIDEBAR: This is a second opinion. The Hof reviewed this movie when it was in theaters. Here’s his review. This story follows an emotionally scarred family trio. Brendan Conlon (Joel Edgerton) is a high school physics teacher who returns to his former profession (MMA fighter) for extra money to keep his home afloat from foreclosure. When this financially desperate decision results in his suspension without pay, he has no choice but to engage in mixed martial arts full time. Meanwhile Brendan’s brother Tommy (Tom Hardy) returns home from serving with the Marines, arriving at the doorstep of his father (Nick Nolte as Paddy Conlon) and eventually seeking him out as a trainer for a grand prix MMA tournament which will recognize the toughest middleweight fighter in the world…the tournament is called Sparta! This already has all the trappings of a good sports fighting movie. However, we soon learn that Tommy has not a warm ounce in his heart for his alcoholic father, who trains Tommy desperately hoping to find some vestige of reciprocal love in his unflaggingly resentful son. Paddy also yearns to reconnect with Brendan, who shuns his destroyed father despite the fact that one of his little girls has never met her grandfather. As if this wasn’t enough, the enmity Tommy feels for his older brother is yet more vicious than that reserved for his father. 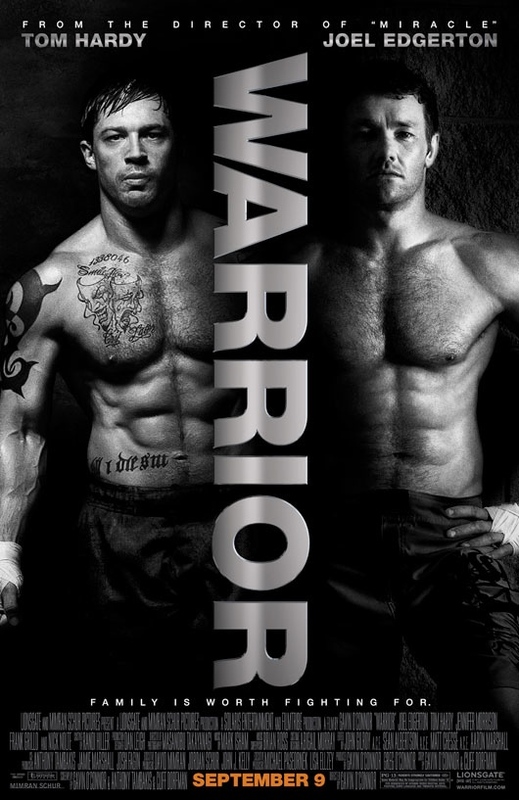 By composition this is an anti-fight-movie, but somehow it strikes me as the greatest fight movie since Rocky! 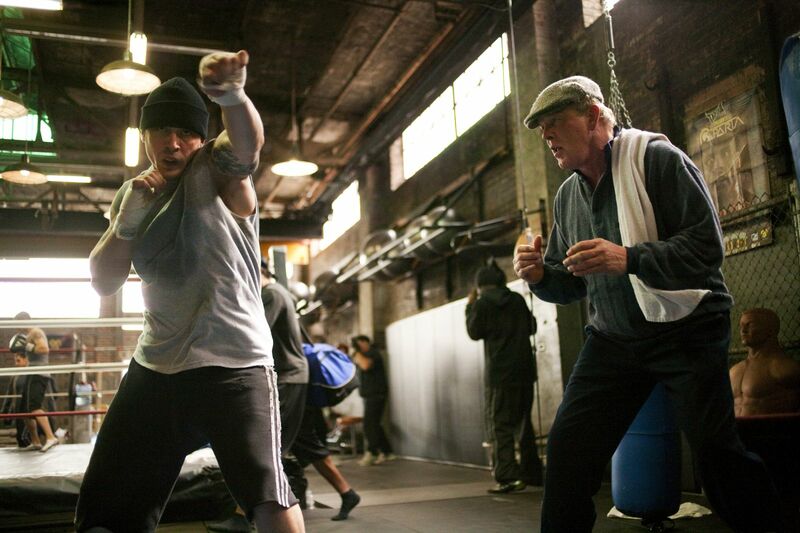 The standard formula of a boxing movie relies on several key elements, all such rules of which are broken in Warrior. 1) Extensive training scenes demonstrate the fighter’s hardship and devotion—training scenes in this film are minimal and seem more informative about mixed martial arts than demonstrative of the hardship or devotion. 2) The fighter turns to his family for support to overcome the training and insecurity of the upcoming fight—the only family under the lens here is a sundered father and sons who all turn to the fights to escape their family’s general paucity of love and forgiveness. 3) The fighter has a resistant loved one and his relationship is tested—Brendan’s wife, while clearly not a fan of the idea, makes no concerted effort or threat to keep her husband out of the ring. 4) The actual fights are few in number and serve as highlight montages, building up to post-victory catharsis—these fights are extensive, numerous, and view reel-to-reel as if complete, with most catharsis delivered “during” the fights! 5) The fighter faces an unlikeable (or at least very arrogant in the case of Rocky’s Apollo Creed) or even evil antagonist—the antagonist in this film is the Conlon brothers’ unwillingness to forgive. The single major element that the classics have in common with Warrior is that Brendan is the ultimate underdog and, like Rocky Balboa, fights from the heart. You never think he should be able to defeat his opponents, but you believe it when he does it! While this movie is not so much about who wins the fight, it is still very much about victory. Nick Nolte plays the damaged, AA-devout, alcoholic Paddy to perfection. He drove his family apart and crumbles whenever he is reminded of the monster he once was and is horrified by the thought of becoming that monster again. He serves as the bone on which his children sharpen their fangs. Amid this loveless viciousness, this film manages to pull the audience from feeling irreparably beaten, to excited and motivated, and ultimately inspired—perhaps awestruck. The fights were thrilling, shocking and technically stunning. On the softer side, my throat tightened up more times than I care to admit and culminated in some serious guy-crying in the same five minutes that I was screaming at the screen during the final fight as if I had money riding on it. I can’t remember feeling so affected…and it felt amazing. This movie isn’t for MMA fans, it’s for everyone. As long as everyone is old enough, make a family movie night out of it. Don’t miss this one. Don’t you dare! Wow John. Way to wax poetic in this review!